Before any routine use of in vivo diode probes, a set of initial studies is required. These consist of the measurement of calibration and correction factors (CFs), checking the system, methodology and the use of the factors in practice; and clinical pilot studies to establish the existing accuracy and precision of given treatment situation. ,, The ideal diode for in vivo dosimetry should show minimal dependence on field size, source-skin distance (SSD) and interposition of modifying devices such as wedges. ,, CFs need to be modified with accumulating dose. According to previous studies, wedge CFs of ionization chamber dosimeters in different wedge directions at various off-axis distances were different from those at central axis,  while in other studies carried out by diode dosimeters, no differences between them were considered. ,, So, it is necessary to investigate the response of diodes at different directions of externally wedged fields. The importance of this statement becomes clearer when considering that in the past, in vivo dosimetry papers, where the entrance and exit surface diodes were used in order to determine target dose, one of the diodes was shifted out of central beam axis to avoid shadow effect. , Moreover, sometimes it is necessary to determine the delivered dose to organ at risk placed off axis, from surface doses in wedged fields. In this case, most previous studies supposed that the target was exactly at the middle of entrance and exit surfaces and several approximate methods were implemented, ,,,, although target or organ at risk is not exactly at the middle of entrance and exit surfaces. It seems that a new algorithm is necessary for improving the dose estimation accuracy in wedged fields. In this paper, the off-axis wedge CF (OAWCF) was evaluated by different arrangements of wedge directions on entrance and exit surfaces of a polystyrene phantom. This research presents a systematic study of the influences of OAWCFs, in different field sizes and SSDs, for 60 Co and 6 MV photons, for dose values, and then suggests a method to estimate the dose value in any depth of the tissue. The investigations were performed using 60 Co photon beams generated by a Teratron 780C 60 Co treatment machine and 6 MV photon beams generated by a Varian Clinac 2100C. T60010L model (p-type diodes for 1-5 MV photon energies with a 1-cm water equivalent build-up cap) and T60010M model (p-type diodes for 5-13 MV photon energies with a 2-cm water equivalent build-up cap) of PTW diodes were used for 60 Co and 6 MV photon beams, respectively. OAWCF values were determined under different physical conditions for use in clinical in vivo dosimetry. According to other investigations, percentage depth dose (PDD) values of wedged fields in all directions at different off-axis distances are approximately equal to those of open fields at central axis. , So, PDD values of open fields at central axis were used in the above equations. To reduce statistical error, the target dose (Dtarget) can be concluded from averaging of equations (8) and (9). In our proposed algorithm which is illustrated in [Figure 1], after dose measurements using entrance and exit diodes, OAWCF en and OAWCF ex are applied respectively on entrance and exit dose values for the corresponding field size by considering the direction and quantity of diode positioning out of central beam axis. Then, if SSD is different from reference SSD, SSD CFs are applied on the obtained entrance and exit doses. In the next step, the entrance and exit transmission factors (equations 4 and 5) are applied on entrance and exit dose values. By means of this, PDD tables must be used to address 60 Co and 6 MV photon beams of any field size. It should be noticed that the PDD values are strongly affected by SSD. Therefore, to determine PDD d (and PDD ex ) at non-reference SSDs, the Mayneord factor is needed. In other words, PDD d (at non-reference SSD) = (Mayneord factor) × PDD d (at reference SSD). In the next step, if the patient thickness is different from reference thickness (15 cm), the thickness CF is applied on exit dose value; otherwise, it goes to the next step. After that, the BSF is applied on it. Finally, the arithmetic mean of entrance and exit dose values is calculated. In this study, the entire diode and ionization chamber measurements were performed three times and the average of them was calculated to reduce statistics errors. To check the accuracy of this algorithm, depth doses at different off-axis points within phantom were measured directly with ionization chamber. Calculated doses were acquired from entrance and exit diode readings corresponding to each point and applying them into the algorithm. The off-axis CFs with the open field were measured for 60 Co and 6 MV photon beams on the entrance and exit points [Table 1]. The results illustrate that deviation of entrance off-axis CFs (CF off,en ) for 60 Co and 6 MV photon beams is less than ± 1% for reference open field sizes. On the other hand, the results illustrate that deviation of exit off-axis CFs (CF off,ex ) for 60 Co and 6 MV photon beams (for reference open field sizes) is within ±2%. The OAWCF was determined for 60 Co and 6 MV photon beams on the entrance and exit surfaces of a polystyrene phantom. We obtained the estimated values of OAWCF en and OAWCF ex for 30°, 45° and 60° physical wedges using 60 Co photons, with the maximum possible square field size available for these wedges (10 × 10 cm 2 ) on the entrance and exit surfaces of the phantom [Figure 2]. The results were obtained both in the wedged direction (positive direction: toward the thick edge, negative direction: toward the thin edge) and in the non-wedged direction. The OAWCF en and OAWCF ex were determined for 15°, 30°, 45° and 60° physical wedges also using 6 MV photon beams with the maximum possible square field usable for all of them (15 × 15 cm 2 ). The results for 6 MV photons are shown in [Figure 3]. [Figure 2]a shows that maximum variations of the OAWCF en for 60 Co photons at a 10 × 10 cm 2 field size in the wedged and non-wedged directions are 16 and 6%, respectively. [Figure 3]a shows that the maximum variation of OAWCF en for 6 MV photons at a 15 × 15 cm 2 field size in the non-wedged direction is about 1%. Also, the maximum variation of OAWCF en at this field size in the wedged direction is 4.7%. It can be seen from [Figure 2]b and [Figure 3]b that the maximum variations of OAWCF ex in the wedged direction for 60 Co and 6 MV photons are 8 and 6.8%, respectively, and the maximum variations of OAWCF ex in the non-wedged direction for 60 Co and 6 MV photons are 4 and 2%, respectively. Moreover, the values of OAWCF en and OAWCF ex were determined at the reference field size (10 × 10 cm 2 ) for 6 MV photons with mentioned wedge angles and it was found that the trend of OAWCF variations at 10 × 10 cm 2 field size is similar to that at 15 × 15 cm 2 field size (with a slight difference due to corrections of field size). The entrance and exit field size CFs (CF f.s,en and CF f.s,ex , respectively) must be known to account for the difference of diode responses between the reference 10 × 10 cm 2 open field size and any other open field sizes. 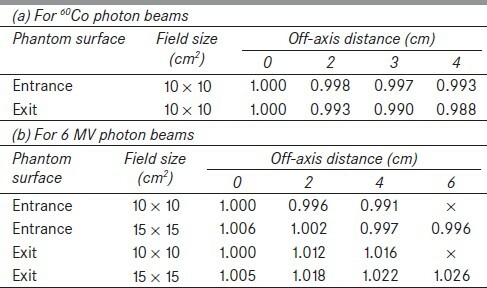 [Table 2] shows the CF f.s,en and the CF f.s,ex for various field sizes using the 60 Co and 6 MV photon beams. We determined the entrance and exit SSD CFs (CF SSD, en and CF SSD, ex, respectively) for 60 Co and 6 MV photons. [Table 3] shows the CF SSD, en and CF SSD, ex for 60 Co and 6 MV photon beams. The BSF as a function of the collimator opening was estimated for 60 Co and 6 MV photon beams on the exit surface of phantom, as shown in [Figure 4]. [Figure 5] shows the variations of CF Z for an exit diode exposed to 60 Co and 6 MV photons when polystyrene phantom thickness increased from 5 to 35 cm. The results of dose measurements and those calculated from proposed algorithm for three typical positions are presented in [Table 4]. The maximum differences between measured and calculated doses at all point measurements (which are not presented here) were less than 0.5%. The importance of considering entrance and exit CFs (i.e. field size, SSD, etc.) 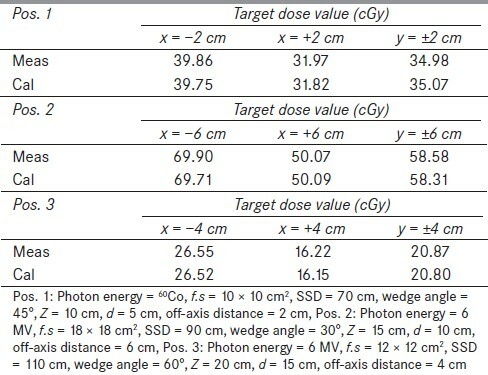 in the estimation of target dose has been shown in [Table 2] and [Table 3]. In other words, if one of these factors was not calculated and applied correctly, it would probably cause irreparable faults in tumor dose estimation during in vivo dosimetry process. As shown in [Figure 5], variations of thickness CF in 60 Co and 6 MV energies have different trends, i.e. maximum variations of thickness correction for 60 Co and 6 MV photon beams are 10 and 5%, respectively. It can be attributed to the fact that dose rate decreases for 60 Co photons faster than that for 6 MV photons with depth. 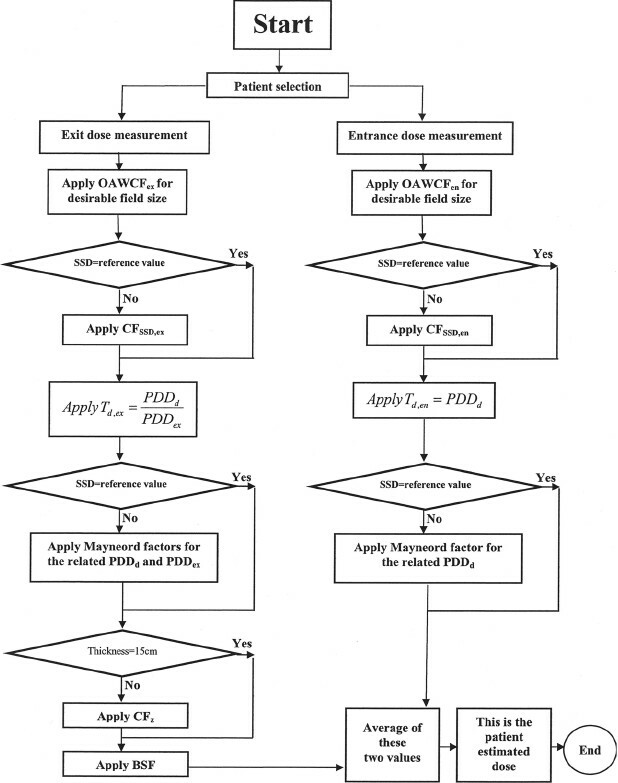 The results of dose measurements and calculations using the proposed algorithm, shown in [Table 4], illustrate a good agreement between the direct dose measurements using the ionization chamber and dose calculations using our algorithm, which confirms the validity of the presented algorithm. Some papers have been published about dose estimation out of central beam axis from surface measurements. In these researches, entrance and exit diodes were positioned on central beam axis and target doses in off-axis positions were obtained by using portal film situated behind the exit surface and applying the related equations. , The advantage of our proposed algorithm in comparison to the above-mentioned studies is that there is no need to use film dosimeters, thus avoiding the film dosimety problems (i.e. calibration process, film developing, etc.). Also, our algorithm was focused on wedged fields, which differentiated it from other studies. In some studies, coordinated measurements of entrance and exit doses with diode dosimeters were done to calculate delivered dose to the target using arithmetic mean and geometric methods. ,,, In these cases, the arithmetic mean method showed errors within 4%, while the range of errors for the geometric method was within 1.5%. In comparison, the error of our method is within 0.5%. This can be attributed to the fact that in our algorithm, the estimation of delivered dose at exact depth is considered and using approximated depth for target is avoided. On the other hand, dose calculation from entrance and exit diode readings was done in accordance with the real depth of target. While in similar studies, ,,, the entrance and exit dose values were averaged via arithmetic methods without consideration of exact depth of target. Thus, the insignificant errors of the dose calculation algorithm in the current study make this in vivo dosimetry procedure more effective than the previous investigations. It is noteworthy that these measurements were carried out only for homogeneous tissue. In our work to be published, the application of the current algorithm to address tissue inhomogeneities in off-axis wedged beams will be demonstrated. The proposed algorithm in this study is an accurate method for error detection in megavoltage radiotherapy with externally wedged beams. It is concluded that because the OAWCFs' variations for entrance and exit diode dosimeters are totally different in each direction, without applying these factors, systematic errors in the estimation of target dose would be achieved. In summary, it can be concluded from the presented results that diode dosimeters can be used for in vivo dosimetry in clinical radiotherapy when using wedged beams. This research was supported by a grant from Tehran University of Medical Sciences and Health. This work was done in Cancer Institute of Iran, and the authors would like to thank the members of this institute for their valuable assistance. 1. Rodriguez MI, Abrego E, Pineda A. Implementation of in vivo dosimetry with Isorad semiconductor diodes in radiotherapy treatment of the pelvis. Med Dosim 2008;33:14-21. 2. Tung CJ, Wang HC, Lo HS, Wu JM, Wang CJ. In vivo dosimetry for external photon treatments of head and neck cancers by diodes and TLDs. Radiat Prot Dosim 2004;111:45-50. 3. Howlett S, Duggan L, Bazley S, Kron T. Selective in vivo dosimetry in radiotherapy using p-type semiconductor diodes: A reliable quality assurance procedure. Med Dosim 1999;24:53-6. 4. Huyskens DP, Bogaerts R, Verstraete J, Loof M, Nystrom H, Fiorino C, et al. Practical guidelines for the implementation of in vivo dosimetry with diodes in external radiotherapy with photon beams (entrance dose): ESTRO booklet No.5 (Belgium: Garant); 2001. 5. Colussia VC, Beddar AS, Kinsella TJ, Sibata CH. In vivo dosimetry using a single diode for megavoltage photon beam radiotherapy: Implementation and response characterization. J Appl Clin Med Phys 2001;2:210-8. 6. Millwater GJ, Macledo AS, Thwaites DI. In vivo semiconductor dosimetry as part of routine quality assurance. Br J Radiol 1998;71:661-8. 7. Meijer GJ, Minken AW, Ingen KM, Smulders B, Uiterwall H, Mijnheer B. Accurate in vivo dosimetry of a randomized trial of prostate cancer irradiation. Int J Radiat Oncol Biol Phys 2001;49:1409-18. 8. Loncol T, Greffe JL, Vynckeir S, Scalliet P. Entrance and exit dose measurements with semiconductors and thermoluminescent dosimeters: A comparison of methods and in vivo results. Radiother Oncol 1996;41:179-87. 9. Leuneus G, Dam JV, Durtex A, Schueren E. Quality assurance in radiotherapy by in vivo dosimetry . 2. Determination of the target absorbed dose. Radiother Oncol 1990;19:73-87. 10. Voordeckers M, Goossesns H, Rutten J, Bogeat WV. The implementation of in vivo dosimetry in a small radiotherapy department. Radiother Oncol 1998;47:45-8. 11. Huang K, Bice WS, Hidalgo- Salvatierra O. Characterization of an in vivo diode dosimetry system for clinical use. J Appl Clin Med Phys 2003;4:132-41. 12. Jornet N, Ribas M, Eudaldo T. In vivo dosimetry: Intercomparision between p-type based and n-type based diodes for the 16-25 MV energy range. Med Phys 2000;27:1287-93. 13. Wolff T, Carter S, Langmack KA, Twyman NI, Dendy P. Characterization of a commercial n-type diode system. Br J Radiol 1998;71:1168-77. 14. Saini AS, Zhu TC. Dose rate and SSD dependence of commercially available diode detectors. Med Phys 2004;31:914-24. 15. Mayler U, Szabo JJ. Dose calculation along the nonwedged direction for externally wedged beams: Improvement of dosimetric accuracy with comparatively moderate effort. Med Phys 2002;29:748-54. 16. Nilson B, Ruden BI, Sorcini B. Characterization of silicon diodes as patient dosimeters in external radiation therapy. Radiother Oncol 1998;8:279-88. 17. Huyskens D, Van Dam J, Dutreix A. Midplane dose determination using in vivo dose measurements in combination with portal imaging. Phys Med Biol 1994;39:1089-101. 18. Broggi S, Fiorino C, Calandrino R. In vivo estimation of mid line dose maps by transit dosimetry in head and neck radiotherapy. Br J Radiol 2002;75:974-81. 19. Van Dam J, Marinello G. Methods for in-vivo dosimetry in external radiotherapy. In: ESTRO booklet series: Physics for clinical radiotherapy, no.1. Leuven: ESTRO and Garant; 1994. 20. Keall P, Zavgorodni S, Schmidt L, Hascard D. Improving wedged field dose distributions. Phys Med Biol 1997;42:2183-92. 21. Allahverdi M, Geraily G, Esfehani M, Sharafi A, Haddad P, Shirazi A. Dosimetry and verification of 60 Co total body irradiation with human phantom and semiconductor diode. J Med Phys 2007;32:169-74.